Private Lake Michigan Beach Frontage! This beautiful Holland home is the perfect location for your vacation destination. There are 33 steps separating you from the golden sand beach of Lake Michigan. Everyone will enjoy the wonderful Lake Michigan sunsets and views from the house, this is truly a one of a kind cottage with great character and charm. This vacation home is minutes away from all of your favorite "things to do!" This cottage comfortably sleeps 11. 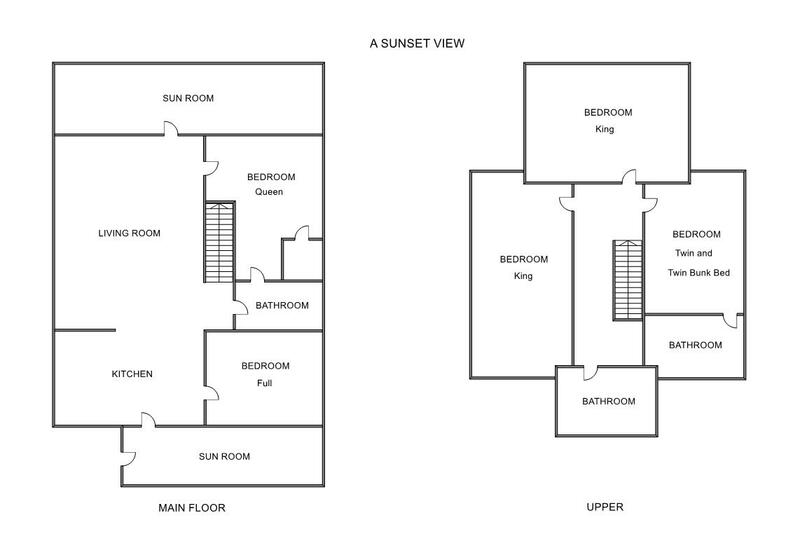 There are 3 bedrooms and a full bathroom on the second floor. The main floor has 2 bedrooms and 2 full bathrooms. ALL of the bedrooms have beautiful Lake Michigan views. The screened in sun porch is where you will start your day with coffee and end it playing games with your family while watching the evening sunset. There is an outdoor shower as well to wash off the sand and a clothes line to hang bathing suits and towels after a fun filled day on the beach! The house also features a nice large lawn, which is a great place for the kids to play games and run around! Beach update 2018: Our staff visited this property at the end of April 2018 to check the beach frontage. Lake Michigan waters have risen over the past year causing ever changing beach conditions across the state. At the time of our visit, there was more beach then in the pictures. Note from Owner: "If you enjoy a lakefront home, our cottage will be the perfect place for your next family vacation! Only 33 steps down to the lovely waters of Lake Michigan! A three-season glassed in porch looks out to the lake and is good for all ages to take in the breathtaking, unobstructed view of the water and the sand. You will drive in to the property through the private wooded lot, and arrive to see the cottage which we’ve owned since 1971 (built in 1928) and was remodeled in 2001 and has two-stories with 5 bedrooms and three bathrooms. You can start your day either inside with coffee on the porch and the beautiful view of the glittery water, or on the outside deck which overlooks the lake and is a relaxing spot to also enjoy the gorgeous sunsets. Additional to the amenities listed with both a charcoal and small gas grill and an outside picnic table, and hammock. The fresh breezes waft through windows with cross ventilation in the cottage. The property has woods behind the cottage, and plenty of lawn for kids to play outdoor games. We’ve enjoyed this home with three generations over the decades and have decided to open it up for a few weeks for other families to enjoy. We know you will enjoy our home for your vacation getaway!"